You get to have a bonfire without the hassle of digging a hole in the ground. 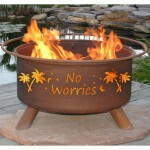 They are convenient and safe as they drastically reduce the chances of starting fires contained in the fire bowl. Unlike gas fire pits, wood burning fire pits are ideal for those who love a traditional fire experience complete with a crackling fire and smoke. Whether you want to add a decorative piece of decor to your outdoor space, whether you want to a create classic contemporary look or a sophisticated elegant look and add overall beauty to your outdoor living space, you will find a fire pit that will be be to do just that. Great for complementing other outdoor features and structures such as swimming pool, pergolas and gazebos. Wood burning fire pits are great for creating a focal point for social gatherings. They are great for providing additional light using fire light. If you’re looking for a wood burning fire pit, take a look at some of our top best fire pits available in the UK. Landmann wood burning fire pits are the top and best selling brand in the USA known to provide great value for money. 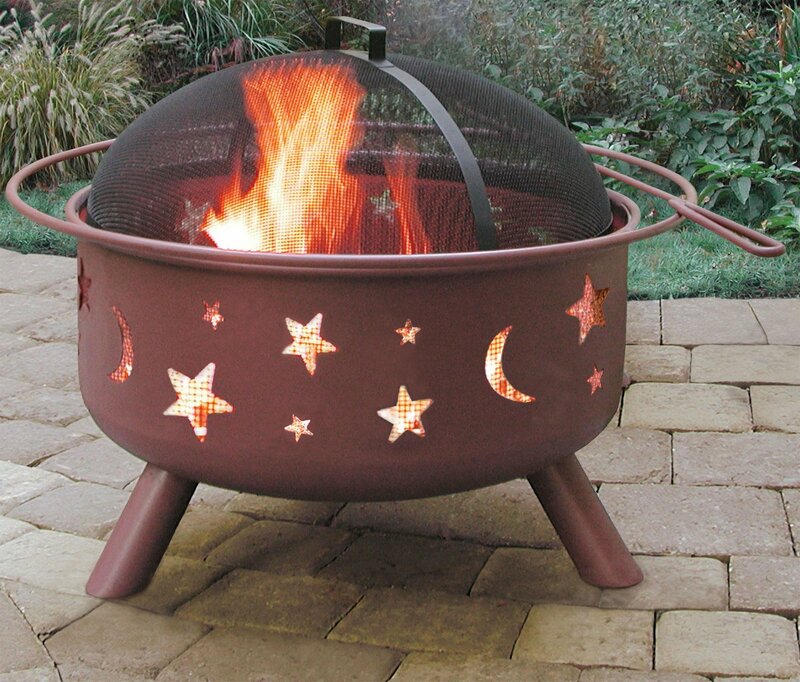 This particular fire pit is made from cold – rolled steel steel with Georgia clay sand paint finish and features star-and-moon cutouts. Unique cut out designs provide great views of the fires. With the right care and maintenance, this fire pit is durable and expected to last. Relatively big and can hold a decent amount of logs. Comes with a fire pit screen to control the embers. Now this one is a popular choice especially for camping. 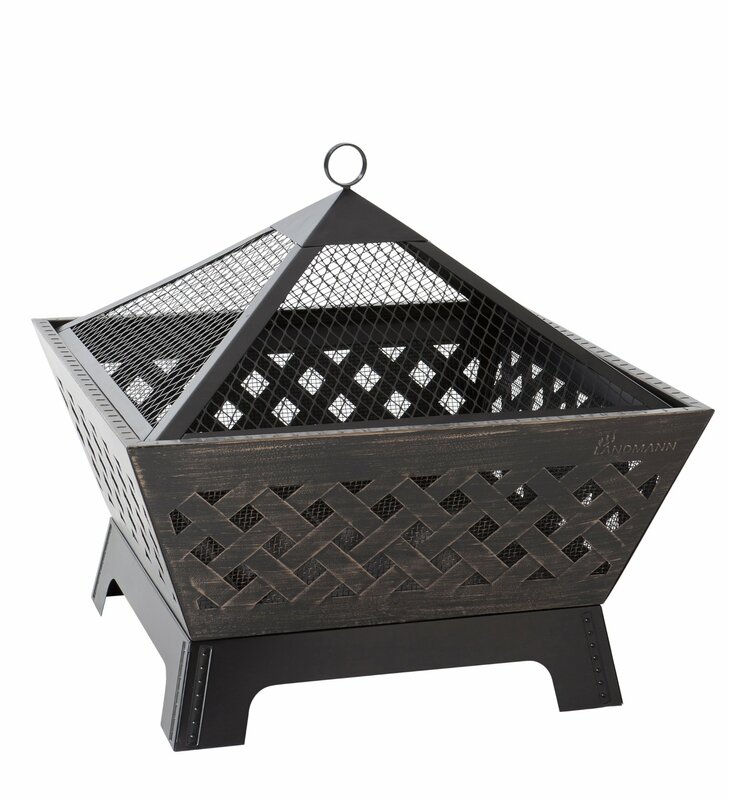 La Hacienda fire pit is crafted from steel and finished in black heat resistant paint to enhance its durability. One of its more prominent features is the folding legs that makes it easy to store or carry. 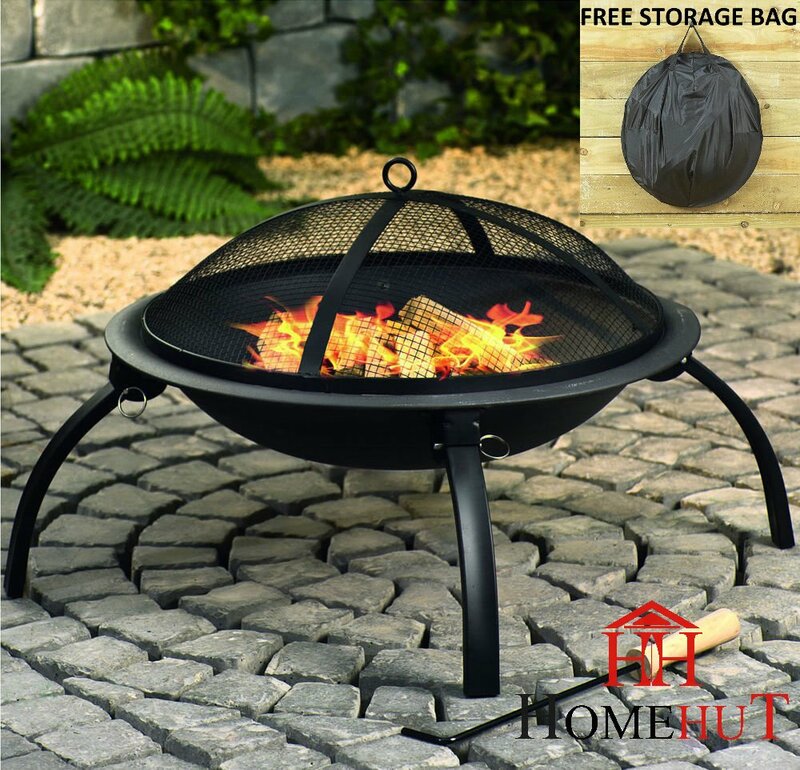 Comes complete with a mesh spark screen with ring handle for keeping the embers contained, a wood grate that also facilitates air circulation in the fire pit and a carry bag for transport and storage. Perfect for camping, tailgating or taking to the beach on the go because of its folding legs that allows it to be compact when needed for easier movement. Comes with a mesh spark screen so you wont have to worry about flying embers causing damage or injuries. Made of 100% thick durable cast iron in bronze color finish and comes with a decorative scroll iron stand that you can remove at your convenience. It features holes at the bottom that help with air flow and drainage. 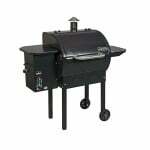 Comes with a cooking BBQ grill for your cooking needs and poker tool for stoking the fire. 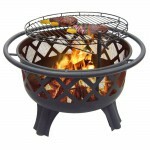 Really sturdy and robust, overall this is a good quality outdoor wood burning fire pit that is durable. Deep enough for relatively large fires. 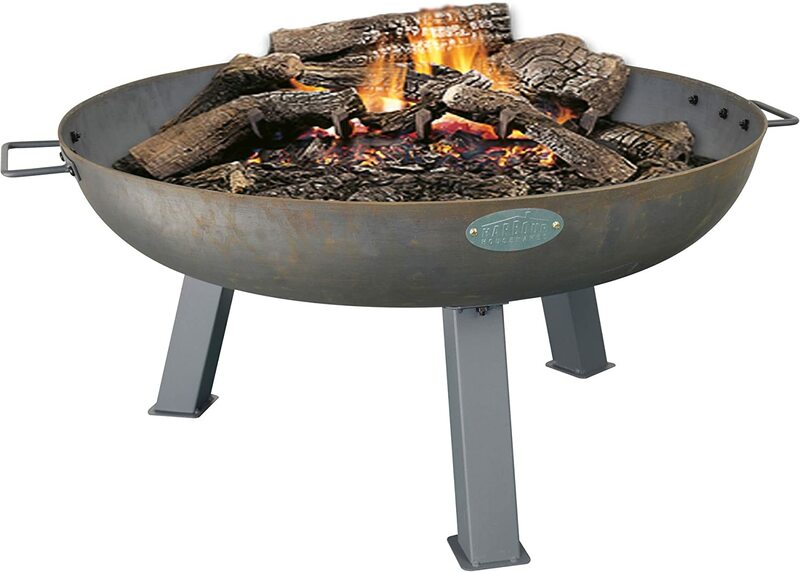 This fire pit that can also double up as a table is made of high quality heat proof steel that is durable and rust resistant. 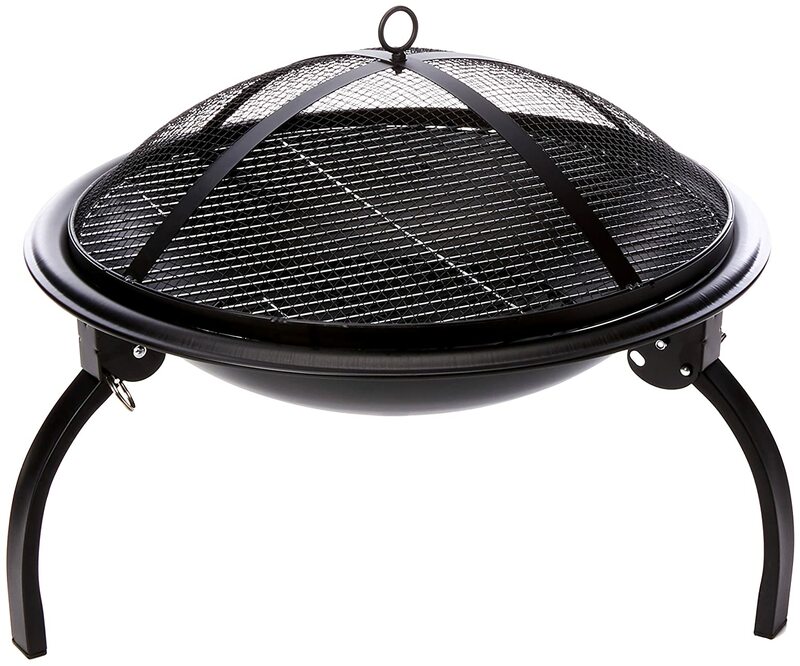 Includes a BBQ Grill, safety mesh screen for containing the embers, a poker tool for removing the mesh screen safely or stoking the fire and protective waterproof cover. 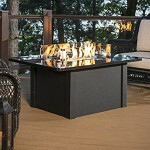 It is multi-functional as it can be used as table thanks to the extra wide rim edges, a fire pit, a BBQ and an ice pit. It is crafted from quality material to make it sturdy and robust for increased durability. Comes with mesh safety mesh screen so no worrying about embers escaping and starting fires and other damages or causing injury. 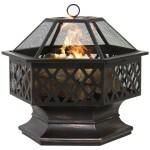 This traditional shaped fire pit is durably crafted from cast iron. With time the color will turn to a rustic patina look that will look lovely. Comes with side handles for easy transportation. Relatively big so it can hold quite a large amount of wood. Turns to an attractive patina look that blends well with the environment. 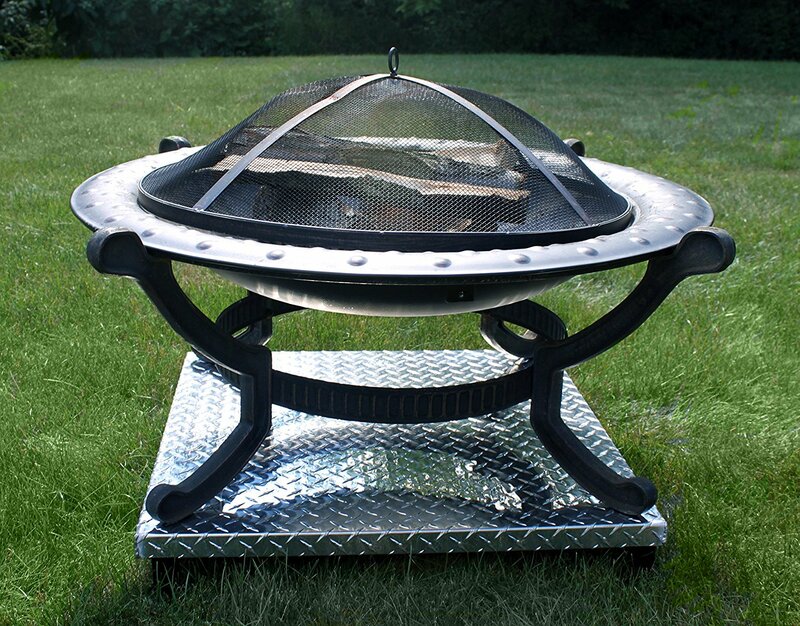 Made from steel, this is another fire pit that would be perfect for camping and tailgating because of its compact size and folding legs. 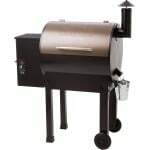 It comes complete with a mesh screen to prevent embers from escaping and causing damage or injury, a wood/charcoal grate, a cooking grill, a poker for rearranging the coals or wood logs and carry bag for easy transportation and storage. Measures approximately H 40″ x D 52″ cm. Perfect for camping, tailgating or any other outdoor gathering on the go. Comes with a safety mesh screen to contain embers during fires. 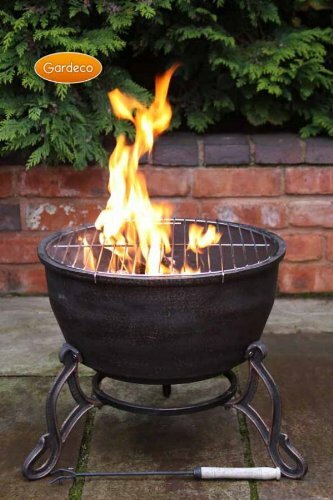 This fire pit is made from strong, durable steel, with eye-catching cut-out detailing on the frame. 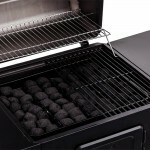 Includes a protective mesh spark guard so you won’t have to worry about embers and a heat-resistant poker for lifting the mesh screen and rearranging the coals or wood logs. Long lasting and gives great value for money. Relatively big for great fires. Includes a safety mesh screen for containing embers. Attractive when lit thanks to the detailed cut-outs. 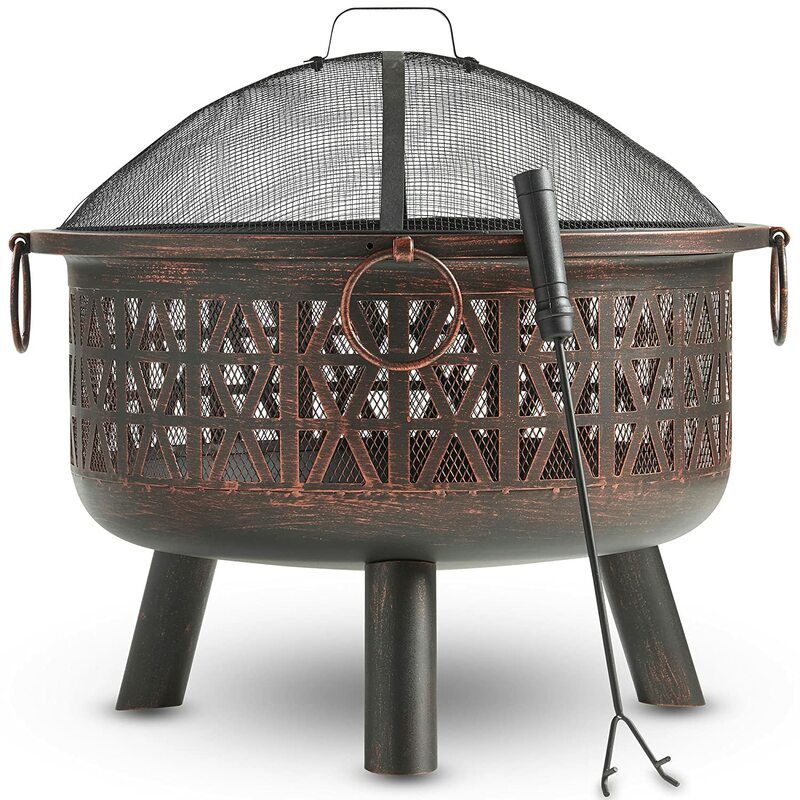 This attractive steel fire pit features a round frame finished in a bronzed aged look and comes complete with a protective weather-proof cover, mesh screen for containing embers and a poker for lifting the screen and stoking the fire. 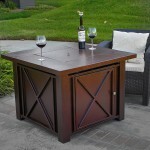 Can be used as a table because of the extra long rims, a fire pit, a BBQ and an ice pit. Multi-functional with 4 in 1 uses. Attractive even when it is not lit which makes it ideal for accenting a patio. You won’t have to worry about getting a spark screen to contain flying embers with this one . Looking for a fire pit that is attractive? This stunning steel frame fire pit features grey mosaic tiling with a lighter grey grout to ensure to adds style and sophistication to your outdoor living space. 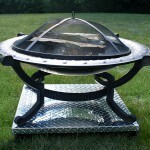 It can also be used as a table as the center disc is removable and can be lifted off the table top to reveal fire pit. Includes a spark guard cover to keep the fires contained and a chrome grill plate. Measures D 70″ X H73.5″ cm. Would make a very attractive centerpiece for any outdoor living area. Comes with a mesh screen for the embers. 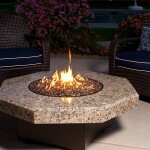 This attractive fire pit features a Mosaic Table top with heat resistant paint. It can be converted to a table as it comes with a cover for the burner area. Also comes with a BBQ grill, weather cover, poker and a safety mesh cover. Measures 76″ x 76″ x 42″ cm. Great for accenting a patio. Can be converted to a table. Don’t have to worry about flying embers as it comes with a screen cover. Crafted from enameled steel with heat proof painting to enhance its durability and ability to withstand nature’s elements. 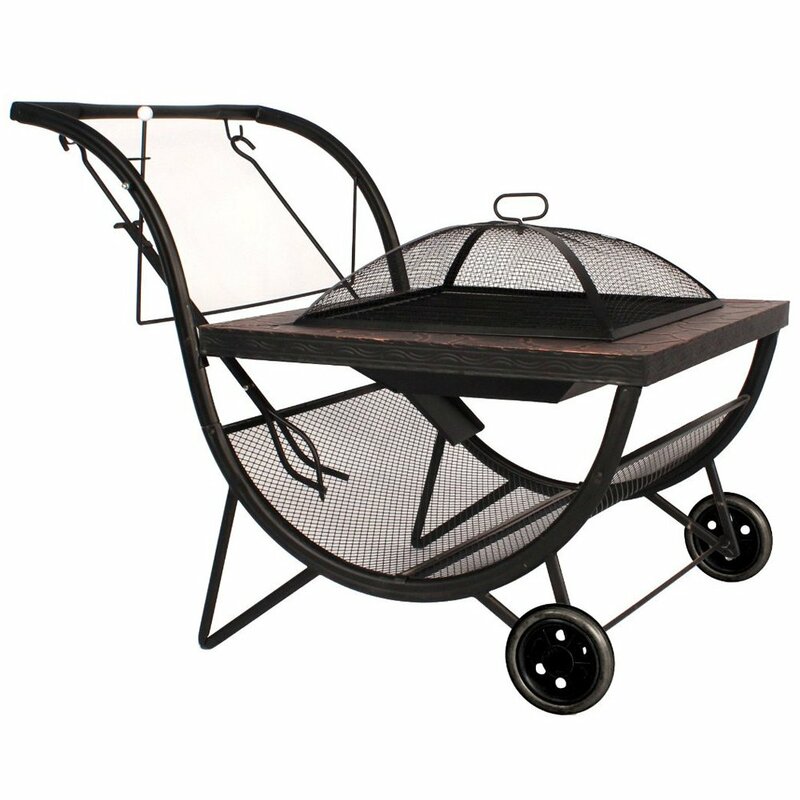 It comes with a wood rack for holding wood and facilitating air circulation within the fire pit, a cooking grill and mesh screen cover for safety against flying embers. Measures D 56″ x H 43″ cm. Small and light therefore easy to carry and transport. No threat of flying embers. 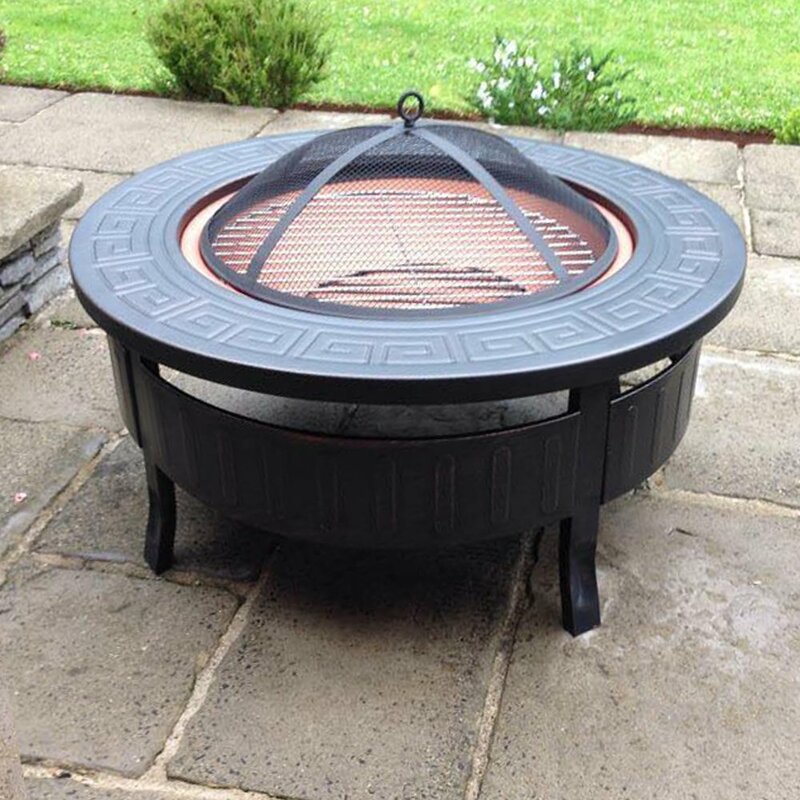 Constructed from steel, the Barrone fire pit is designed with a crosshatch pattern for attractive fires when the fire pit is being used and offers a large 66 cm-square firebox Comes with a heavy-duty removable spark guard cover to keep the fire under control a poker and weatherproof cover. This fire pit comes with wheels and a specially designed ‘under belly’ mesh storage area allows you to store logs for the ultimate convenience. 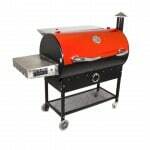 It includes a BBQ grill, a poker and spark screen for keep your fires contained. Uniquely designed making for a great conversation starter. Very convenient to transport and store wood logs. 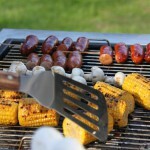 Can you use your fire pit on a wooden deck or grass? When purchasing a fire pit, you may be wondering whether you can safely use it on your wooden deck or grass without damaging the deck or killing the grass. Some manufactures will recommend that you do not use your fire pit anywhere on your deck or grass, and they are right to do so. The bottom of a fire pit usually gets very hot, at an average of between 1,000 to 1,200 degrees Fahrenheit. This is enough heat to damage your deck and kill your grass. 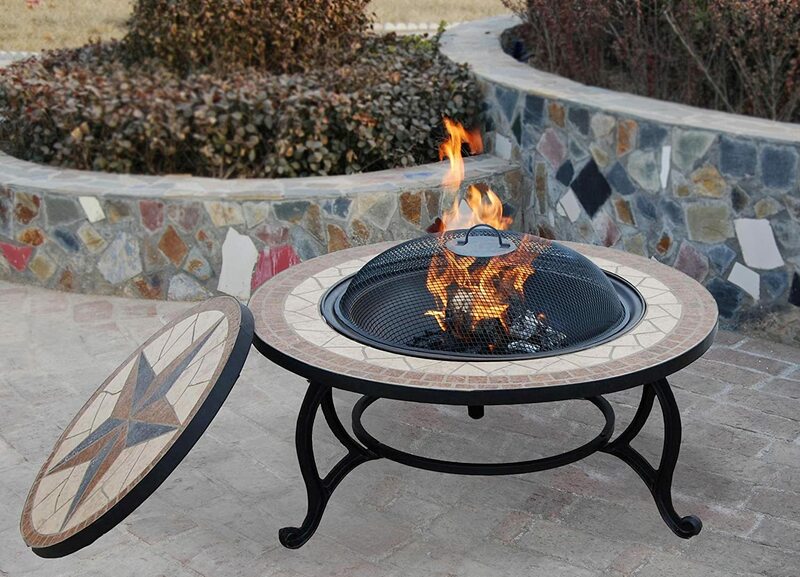 However, if you can get something heat resistant to put under your fire pit like bricks or cement board, then you should be able to use your fire pit without worrying about whether enjoying your fire pit will be at the expense of your precious deck or grass. 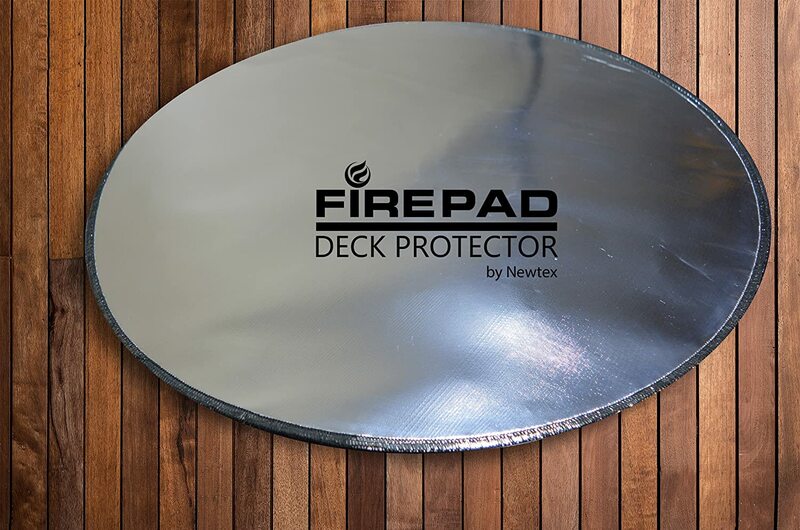 There are also fire pit heat shields/pads, also known as deck protector grass guards like the ones shown above that are designed specifically for use under a fire pit. They are able to effectively insulate the surface from the heat produced by your fire pit as they can withstand temperatures of between 1,200 to 1,500 degrees F. You can read more on these fire pit pads here. 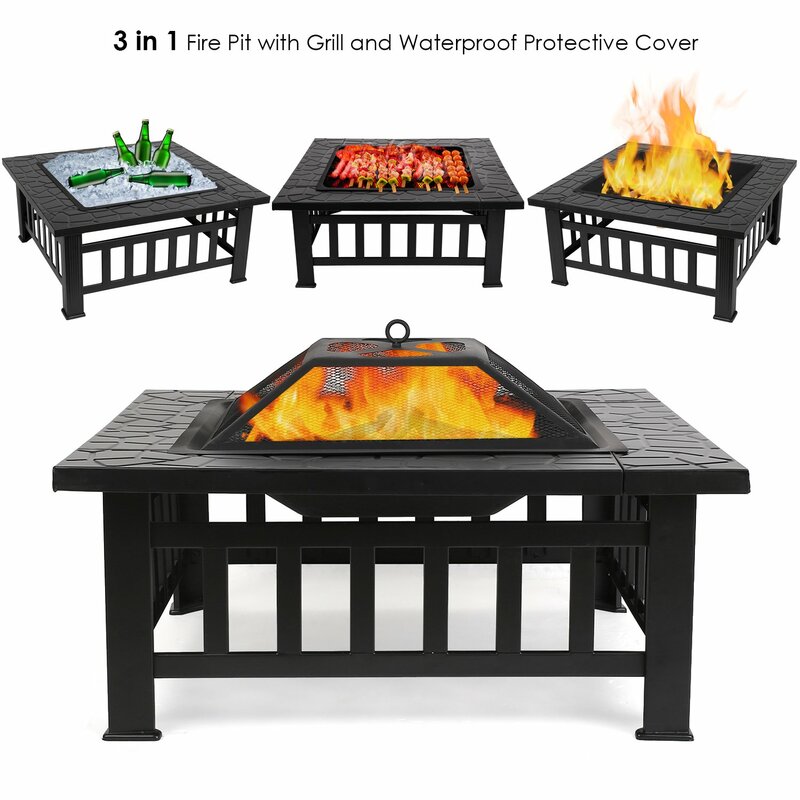 As for the concern of starting fires, a fire pit screen guard cover should have you covered there and the good thing, most of the fire pits above come with their own spark screens. These are wood burning fire pits so obviously, the size and how deep you want your fire pit should be one of your major considerations. The bigger and deeper the fire pit, the more the wood it will be able to hold which means you you will need to add logs less frequently for a longer burn time. 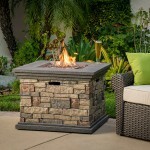 As you go looking for a fire pit to buy, you should already have a budget in mind how much you’re willing to spend. The good thing is, there are fire pits are every price range so finding one that meets your budget shouldn’t be a problem. What I will tell here is, more often than not, the saying “you get what you pay for” is true for fire pits. Of course it goes without saying that the primary function of a fire pit is to provide warmth. 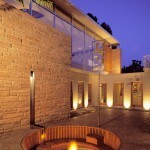 However fire pits can also be used to cook as well as be used to decorate the patio or any other outdoor living space. 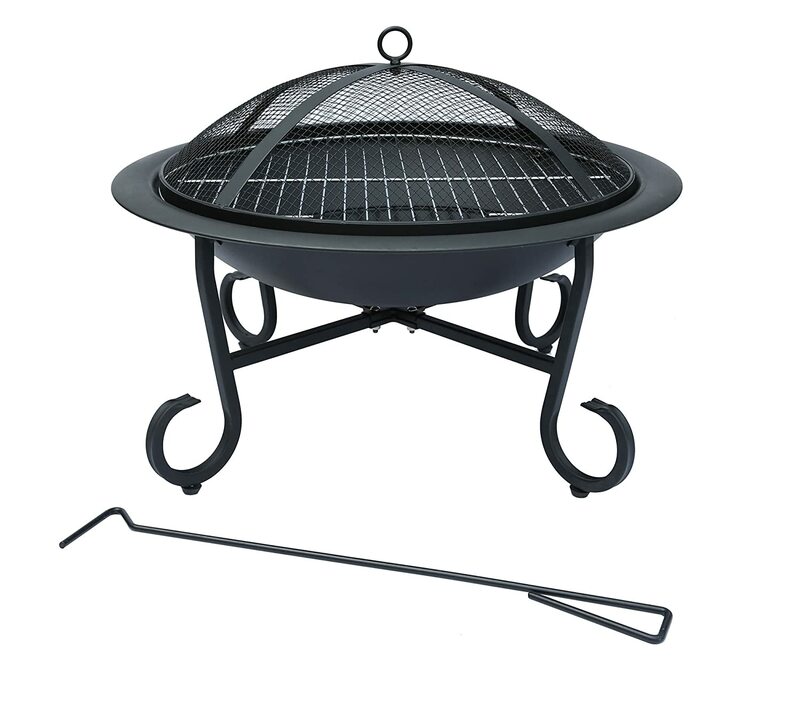 If you love camping then some like the La Hacienda and Home and Garden Fire Pit above, are best suited for this as they are compact and come with folding legs for easier storage and carrying. It’s a fact, a well designed attractive fire pit has the ability to completely transform your outdoor space from just ordinary to unique and stylish. And the good thing is, you can find one that is your kind of budget friendly. 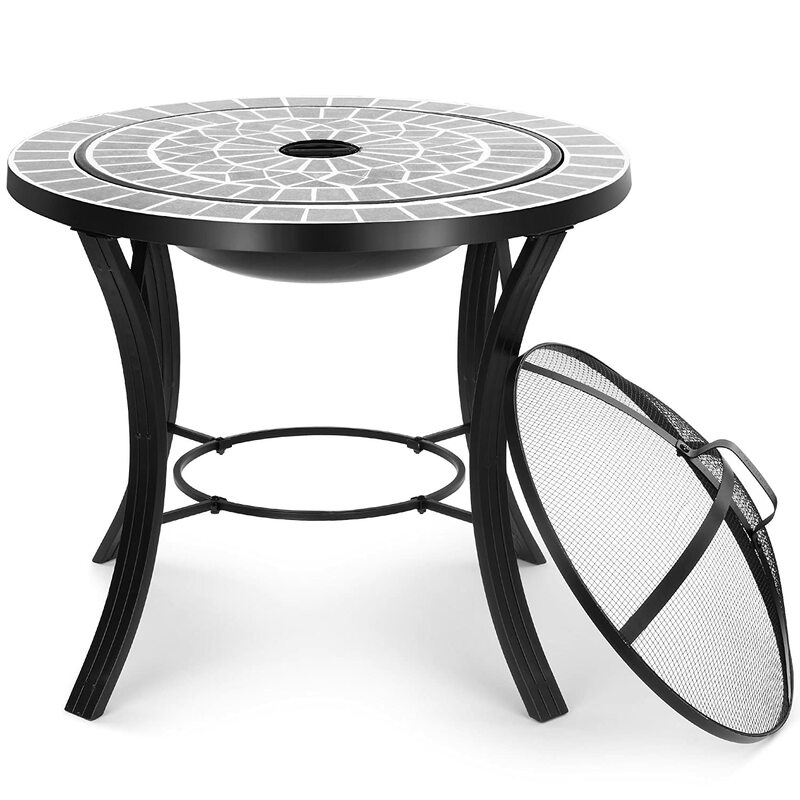 Some like the Femor Fire Pit above with extra wide rims can even be used as tables. So as you shop for a fire pit, look for other things that your fire pit can do for you other than warmth. Most fire pits are made from steel as it is cheaper and considered the most durable and great at withstanding weather elements. Other metals for fire pits are copper and iron while other materials like slate and marble are used as secondary materials mainly for decoration. When it comes to durability, the grade and thickness of the metal will determine how durable your fire pit will turn out to be, as well as how you care for it. There are lots of cheaply made flimsy fire pits in the market and if you’re buying your fire pit online, you may not be able to tell this. This is where reviews come in handy. 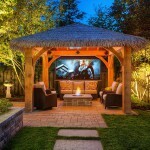 They will tell you what exactly to expect from your fire pit and any problems you’re likely to encounter if any, and in some cases, the solutions to those problems. So In short, read the reviews! Lets be honest, you will likely need a new fire pit replacement after few years, probably even shorter than what you’re thinking right now 😉 Anyway, to ensure your fire pit’s longevity, you need to ensure that you take the necessary measure to enhance the life of your fire pit. Never leave your fire pit outdoors. The fastest way to get your fire pit to deteriorate quickly and end up as a pile of mess after few months, is to leave it outside. That is the single biggest mistake you can make! Metal fire pits even those of the highest quality will corrode and rust when left exposed to moisture. Always keep it indoors or at the very least, under a covered roof. And these fire pits are lightweight so movement shouldn’t be a problem. Use a fire pit cover. It is not enough to keep your fire pit indoors or under a covered patio because moisture can still get to it. To protect it from moisture and other unwanted debris, cover your fire pit in a weather proof cover. These days there are so many of those so finding one that will do the job effectively should be easy. And they are cheap too. Finally, do not let ash accumulate in your fire pit. This is not only messy but there are claims that ash does corrode the base of your fire pit over time. I Don’t know how true this is but hey, just empty your fire pit! Do all the above and you will have drastically improved the chances of your fire pit lasting a few years, provided the quality is unquestionable. Disregard and leave your fire pit at the mercy of nature and her elements and I guarantee you, your fire pit will be all rusted and falling apart after a few months. So, if you’re in the UK and looking for a wood burning fire pit, has our “best fire pits” list at the very least give you some idea of what you now want? We hope so!